I’ve started a vlog. Not a sentence I thought I’d write but there you go. That’s the beauty of writing and creating on the Internet. You come across different things, enjoy them then try new things for yourself. My vlog is called The Weekly Writing Vlog and I’m filming it vertically so it’s uploaded onto IGTV once a week. Every Sunday morning to be exact. I’ve watched a number of vlogs for some time. Zoe Sugg’s (Zoella), Louise Pentland and, more recently, Brummy Mummy of 2. I’m probably not the key demographic for any of these vlogs but I find them enjoyable and fascinating to watch. And they make household chores so much easier if someone is chatting away to you. I don’t just watch them for comfort, however. I’m also learning from them. For example how the vlogger talks to camera (it’s not as easy as it looks), how they position their camera and their use of b-roll that overlays aspects of the film (say where they’re talking and they demonstrate with another clip) or used to move on time or to another subject. What’s so interesting about watching someone else’s life? And I’m addressing this because I have a suspicion that you, like me, might be new to vlogs yourself OR possibly have never watched one in your life. Vlogging is something that has been around for many years now. It’s where you chat to camera as you go about your week. Like a diary but in video format. This has been a big thing in the generation below mine (I’m very aware that my real life friends might not ‘get’ this aspect of me) with YouTubers going on to fame and fortune. And now, with Joe Sugg (Zoe’s brother) on Strictly this autumn they’re crossing over into the mainstream. Human beings are, by nature, curious. That’s why we watch TV, why we read books and articles. We’re interested in how other people live their lives. Sometimes their lives can be about big, exciting things, like travel. Or, sometimes their life can focus on the mundane. Like cleaning. I mean, look at the interest in Mrs Hinch this month. Her Instagram where she shares her cleaning tips on Stories has blown up. From 3000 to over 300,000 in a matter of days. Which brings me to other reasons why people like to watch vlogs. They find them calming, comforting, inspiring, or they help combat temporary loneliness. One of the main aspects of Zoe and Louise’s vlogs that I enjoy seeing is their business and writing life. I am fascinated by how other people write and I love seeing writing desks or writing rooms and how the writer has set them up. 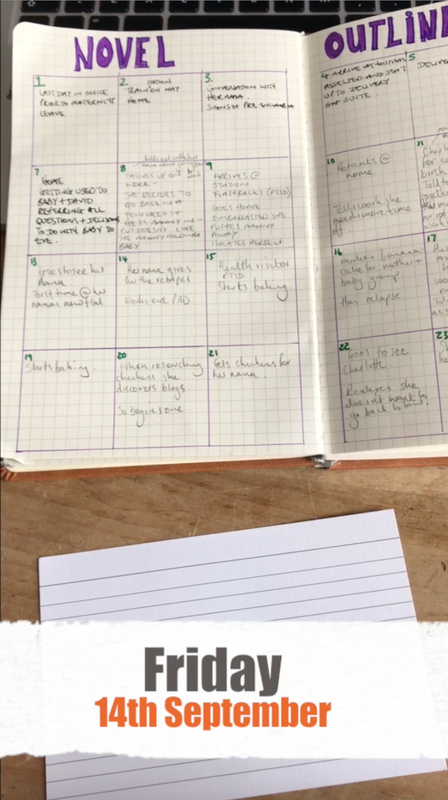 I’m also fascinated how people use notebooks (look at the interest in bullet journal YouTube vlogs as well) or plan their novel. Or how they write their novel. To me this behind the scenes of writing is as fascinating as the book itself. (And explains why I was so obsessed with this documentary about J K Rowling for some time). But. I’m struggling to find writers to watch on YouTube. (Maybe that’s because they’re all too busy writing!) And this was one of the reasons why I decided to create my own vlog. Plus I needed to be held accountable. What better encouragement (for me) to sit down and write the blimmin’ novel when you know you’re reporting on your progress? I also, crucially, really enjoy it. I like filming but really really enjoy editing the footage. I’m finding the skills are transferable, too. As I search for the story in the minutes and minutes of footage I’ve recorded so I have cohesive vlog, it is teaching me about how to edit my novel. Which bits aren’t needed to move the story along. It’s the same in writing as it is in film. Why IGTV and not YouTube? The main reason is my audience is already on Instagram and viewing the film is, theoretically, easily accessible (though admittedly not many of my audience have tried IGTV). The second is because IGTV is new. There’s a possibility it is going to be huge and I’d like to be there in its infancy to grow with it. What will be in my Vlog? I’m going to be chatting every day about the writing. I’ve got three main projects. This blog. My novel and my monthly essays on Patreon. I’ll be documenting my writing journey for all of them. This could be what blog posts I’ve written, where I’ve got my inspiration from, how I’m tackling my novel and attempting a brand new project with these essays. Sometimes you can tell it’s early in the morning as my face tells you that. But I’m not attempting to film a beauty vlog! This is warts and all, sometimes happy, sometimes frustrated, writing. And I would love it if you followed along. Edited: 4th October 2018 - I’m now starting to upload the vlogs to YouTube. You can now watch YouTube videos in vertical format on your phones.